EcoBiz, short for Eco-Logical Business, is a certification recognizing businesses in Oregon that adopt best practices and protect the environment. The completely free and voluntary program is designed to prevent and minimize hazardous waste, air and water pollution. 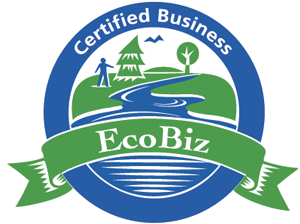 EcoBiz certifies Eco-Friendly Auto Repair & Body Shops, Landscapers, and Car Washes in Oregon. Certified businesses meet high standards to reduce toxics, prevent pollution, and protect the environment. Each certified location has been visited and evaluated by EcoBiz program staff, and certified by the Oregon DEQ and a local water authority. Public agencies, such as fleet maintenance facilities and parks departments, are also eligible for EcoBiz Certification. Link to the EcoBiz website.